The meaning of any colour is always somewhat dependant on culture and also a bit subjective. People have life experiences and emotional associations they have built with colours just like smells and shapes, but that being said, there are a number of things that tend to be fairly universal to people or at least to people of a particular cultural group. I remember reading somewhere (if I could remember where, I would happily include a reference, but I honestly can’t remember) that the combination of yellow and red together in a corporate logo for a company like Burger King (Hungry Jack’s here) or MacDonald’s had been chosen because there was clear evidence that those two colours tend to create an unconscious feeling of hunger in people. This could be explained as a response to the fact that in nature, a lot of fruit is this colour when ready to eat. Another that I read but have no source information for is that in cultures where the people have predominantly light coloured skin, white is often seen as a colour of purity, it evokes ideas of a blank page, or fresh linen, sunlight or freshly fallen snow. It is contrasted against black which is seen as a colour of shadowy hidden things, the colour of ashes and of ink, assuming something was white to begin with, if it has become entirely black, it is now as dirty as it could possibly be. The flip side of this is that in countries where the predominant skin colour is very dark, the colour black is often seen as a colour of life, with shadows being a place to shelter from the heat of the sun, and white is seen as the colour of bleached bones, the colour of death. For those who are interested. 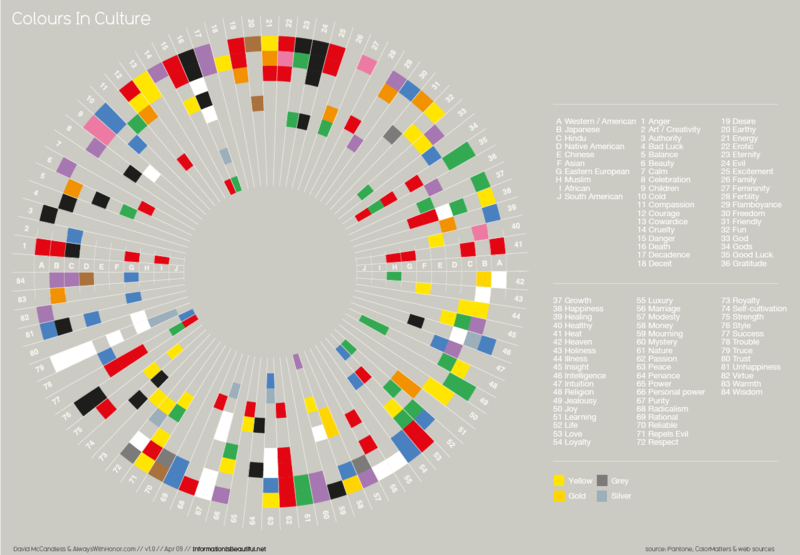 you can see a great infographic of the different cultural meanings of colours on the link below. As a designer, I have to be primarily concerned with my own cultural context first, but looking at the differences is good for getting my head outside the box, and also useful when I deal cross-culturally. Typically in western culture we see red as a colour of passion, fire, blood and danger. Yellow is usually associated with warmth (like sunlight) and happiness, and when coupled with black in stripes it warns us of danger. Green is generally a cool and fresh colour, the colour of health and nature – grass, vegetables, and trees. I talked a bit about blue in the previous entry, so I won’t bother to repeat myself. Purple is a colour we generally associate with richness and royalty. Brown is an earthy colour, it is natural as the colour of wood, animal fur and dirt. Where the primary colours are bright and bold, we also can tint them with white to make them lighter, which makes them less stark, and more gentle, and also potentially more insipid. Shading them with black can have a similar effect of weakening their intensity, but greying them also tends to make them feel less fun. there is a third option when we pass out of the bold primary and secondary colours (primary = red yellow blue / secondary= green orange purple) and that is tertiary colours. Where you can mix primaries – red and yellow to get secondaries – orange, you can also mix secondaries – orange and purple to get tertiaries – russet. Tertiary colours are less popular in a lot of logo designs because their meaning and feeling is unclear. They can tend to all just look like variations on brown – which in essence, they are. Tertiary colours have moved in and out of popularity in past years and indeed in past decades, but they rarely make it into corporate logos, although sometimes they make good supporting colour schemes.